The EU has cancelled a meeting with Macedonia's political leaders, amid a crisis that has seen thousands flocking to anti-government rallies. The meeting had been scheduled to take place in Vienna on Friday. A Macedonian presidential pardon for 56 politicians embroiled in a corruption scandal sparked fury last week. The EU Commission and MEPs say they regret "retrograde steps" in the Balkan nation which are delaying its progress towards EU membership. EU sanctions against certain Macedonian politicians are a possibility, Reuters news agency quoted one EU official as saying. The EU Commissioner for Enlargement, Johannes Hahn, and several MEPs are trying to mediate in Macedonia's political crisis. They had planned to build on the Przino agreement, a political deal reached under EU auspices last year. But in a statement on Thursday the EU officials said it was time for the politicians to deliver. "The persisting rule of law issues in [the capital] Skopje, which undermine this agreement, must be addressed without any further delay," it said. Macedonia's opposition has demanded that President Gjorge Ivanov revoke the mass pardon and postpone snap elections that he called for 5 June. 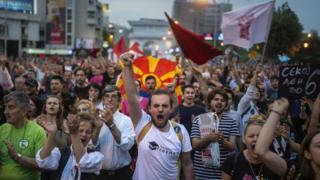 Political deadlock has gripped Macedonia for two years. The opposition has accused former Prime Minister Nikola Gruevski of illegal wire-tapping - allegedly 20,000 people, including politicians and journalists, were bugged. President Ivanov cancelled an investigation into that alleged abuse of power.